Our current external storage clusters just reached 90% disk usage and icinga sent warnings. We still have some months of time to spare; the current clusters has been filling up for at least 2.5 years. Review the ES server spec, mostly only to maximize disk space. MediaWiki writes to multiple active ES clusters in order to avoid SPOF. A cluster is a minimum of 3 nodes (1 master, 2 slaves) but ideally for capacity 4 nodes (1 master, 3 slaves). jcrespo moved this task from Triage to Backlog on the DBA board. First thing we need to determine is the future of this service: should new clusters or shards be added from the application point of view or should we be 100% transparent to the application and just add extra capacity to existing servers (both on disk and memory). @Springle pointed that the innoDB buffer pool efficiency is far from perfect, and that this will need more than extra storage. This is a good point to gather a bit of feedback from the application side of things about the prospect of this service. If just adding space isn't as efficient for InnoDB and we would do better with new servers then let's do that. As long as existing data is copied over to a new cluster I don't see why we couldn't. It would require a bit of read-only time to the affected wikis (can be kept minimal), but otherwise I don't see any real blockers here from the application POV...just some config changes. Please note that hardware purchase, installing and data migration takes months. jcrespo added a parent task: T106386: Compress data at external storage. Removing "blocked by" as this will be done first. Decommission the old servers in line with the renewal policy and buy more powerful servers that would allow a) consolidation, doing more with less servers, and faster b) less human resources needed due to newer parts c) for some amount of years, warranty-covered replacements. One important constraint is that the service should be up and running by November (see previous graphic). We could buy new servers, immediately configure MW to write to the new cluster, then recompress the old cluster, and decommission it when recompression is done (say 3-6 months). We're currently using about 2.7 GB per day, for each of the two ES clusters (by linear regression on yearly ganglia part_max_used). At that rate, we would need about 4900 GB for the next 5 years, plus about 600GB for recompressed old data, so say 5500 GB. That should give plenty of headroom if we plan for another recompression/decommission cycle after 3 years. 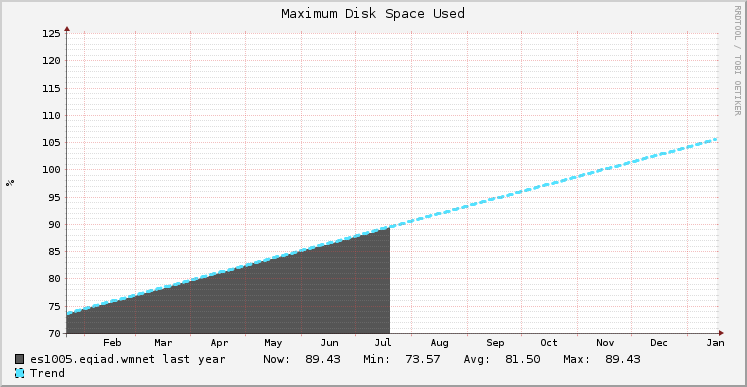 If there is no recompression, and we just migrate the ~2700 GB of old data, the projected disk usage after 5 years will be more like 8100 GB per cluster. It probably makes sense to have a dedicated cold storage cluster, instead of putting the newly recompressed data in the active cluster, since the hardware parameters are a bit different. I see that es1001-1004 is currently used for cold storage. It has a read load in the vicinity of 1MB/s per server, 7.8TB of disk usage, 1.3TB free, so it is a bit overpowered with 12 spindles. Presumably a lot of that 7.8TB has not been recompressed, especially cluster22 and cluster23. So I am thinking that we want 3 new clusters per datacenter: 2 active and 1 cold. We switch MW to write to the 2 new clusters, then recompress as much as possible into the cold cluster, and also migrate any legacy data to it such as cluster1/cluster2. Then decommission es1001-es1010. 3 nodes per cluster, (ideally 4) x 3 clusters x 2 datacenters = 18 - 24 nodes. 2 out of the 3 clusters per datacenter are needed with less than 3 months hard deadline. Warranty, specially for disk replacement! Also +1 to Tim's plan, once we get the hardware. Some nodes, like es1009 are down to 6% available disk space. Hardware has already been ordered for eqiad. es1009 and es1006, both read/write masters are down to 5%-175G. Any news about the order? It shows delivered on 2015-08-20. https://rt.wikimedia.org/Ticket/Display.html?id=9524 has not been updated, even though tracking shows delivered. I'm going to assign this task to Chris, as the RT is also assigned to him. I think everything is here but the disks? The es1 servers may be some of our oldest servers for critical production usage (16GB of memory!). They still have 1.8TB drives, but they could be as old as 4 years, according to some (imported) phabricator tickets. Thanks again, I've already seen the entries on racktables! Was waiting for that to fully own it. After several clones and failovers, the new nodes are working as masters, alongside the old nodes. I will now slowly start the slowly depooling of the old nodes so that they can be decommissioned soon. This is almost completed: we just need to wait for the old server to finish processing dump queries, stop mysqls to confirm we can stop them and clean up the configuration file. Equiad old servers no longer in use, created T113080. Not closing because codfw is still pending. Actually, closing, tracking codfw separately.